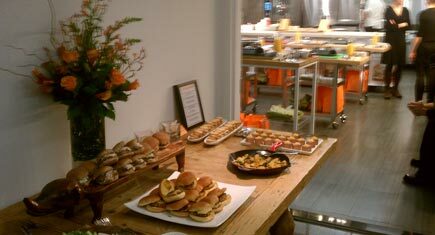 Claire actually served these little chicken burgers at the Just Add OJ event! It has just been a juicy kind of week, hasn’t it? First, Margo recounted her healthy adventures at the Just Add OJ event in New York City, and then we shared 10 fun and inventive ways to use orange juice. And today, the Florida OJ love continues with this chicken burger recipe from one of our fave TV chefs who was at the event: Claire Robinson! Sounds delicious–I’m a big fan of organge juice, especially in salad dressing and marinades. One quick question though: when you add the chicken to the food processor, is it cooked or raw? I assume raw, but when there were no words of caution about making sure it was cooked through (just make sure the outside is golden brown?? ), I thought maybe it needed to be precooked.